Muliti-instrumentalist Andrew Cronshaw variously draws upon the traditional music of the Scottish Highlands, Northern Spain, Finnland and his native England to weave a music of great beauty and originality. 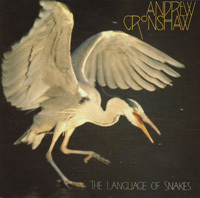 1993’s The Language of Snakes was his sixth solo album. Working with a close band of musical collaborators, Cronshaw magically transforms his disparate source material with a series of unexpected textures and arrangements.